It’s official. 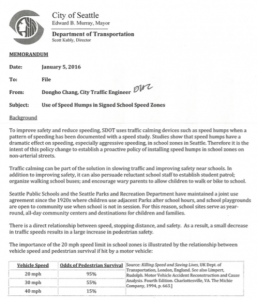 Seattle Department of Transportation (SDOT) will engineer safe streets around ALL Seattle schools! Speed humps are highly effective, inexpensive, and quick to install. Seattle Neighborhood Greenways has been working closely with SDOT on a policy of engineered speed bumps around all schools, based on the Vancouver BC model of traffic calming on non-arterial streets in all School Walk Zones. People who live in school zones that that are not highly prioritized for funding may request speed hump funding through Neighborhood Street Fund or Neighborhood Matching Fund. Read the complete Speed Hump Policy here. Speed Bumps to the Rescue! What’s black and white and gray all over? Lake City Greenways volunteer Monica Sweet was impressed with the speed bumps she’d seen in other neighborhoods. She wanted slower, safer streets where she lived on NE 123rd in Lake City. With no sidewalks and drivers that seemed to rip through her neighborhood at high speeds, speed bumps seemed to offer a simple, inexpensive yet effective safety solution. After a great deal of back and forth with the Seattle Department of Transportation (SDOT), whose staff tried to convince Monica to put in small traffic circles, Monica and her local greenways group prevailed and soon speed bumps will make another Seattle residential street safer for people who walk and bike. 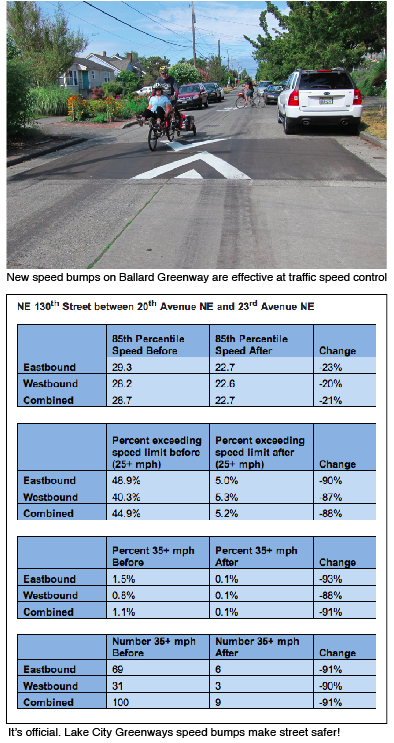 In related news, SDOT just completed the before and after study of vehicle speed on nearby NE 130th Street where speed bumps were installed in the summer of 2014. * P.S. You may hear the terms speed humps and speed bumps used interchangeably by traffic safety professionals. Speed “humps” are actually the official term but according to our friends in Portland traffic engineering, the signs that said “Humps Ahead” were frequently stolen by the public but “Bumps Ahead” were left to perform their traffic calming duty.